One of the most important pieces of advice you’ll be given as a new parent is to make sure you get your baby into a routine as soon as possible. Setting a routine lets baby know exactly what is expected of them and prevents a wide number of problems that can be really difficult to solve later on. However, while you may know WHY it’s important to set a routine, the difficult part is often knowing HOW to set one up. 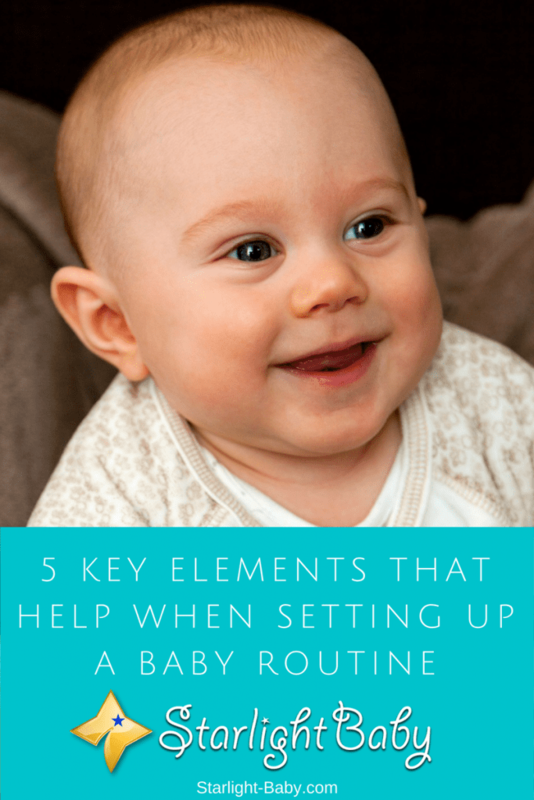 If you’re struggling, below you’ll discover 5 key elements that can really help when setting up a baby routine. The one thing that you need to realize before you even attempt to set a routine is that each baby is different. So, when you’re looking for advice on what times you should set for feeding, napping and sleeping, the information you’re presented with may not work for your baby. Therefore, in order to set a realistic, effective routine, you’re going to need to pay attention to your little one’s individual needs. For example, some babies are perfectly happy getting 14 hours of sleep a day, whereas others need around 17 hours. Some babies also have a faster metabolism so they won’t gain weight as well as others and may need additional feeds. Learning everything there is to know about the habits of your little one will really aid you when it comes to setting a routine. Issues with sleep are one of the most common, frustrating and difficult problems to solve. When your little one first enters the world, they have no idea there is a night time and a day time. They don’t yet know that sleep is something they should do more of during the night, so they end up sleeping whenever they feel like it. This can lead to big problems settling them down to sleep at night. So how can you help your baby to know when it is night and day? It’s actually pretty simple! Once night time arrives, change your baby into their bedtime clothing. Also be sure to keep the house bright, active and noisy during the day and then quieten things down at night while also dimming the lights. These simple tasks will make a huge difference and your little one will soon start to recognize the pattern. It’s really important to realize that the routine you create will need to be altered as your little one grows. As a general rule, babies aren’t going to be able to stick to an overly consistent routine until they are around four months old. One of the key things to remember is as they age, they’re going to require fewer naps during the day. So your routine will need to be adjusted to fit in more play time and less sleep. Then there’s the change in feeding around six months of age when your little one starts eating solids. So, when creating a routine, you need to ensure it’s going to be easy to adjust as time goes on. There are a couple of different routines you can create. Firstly, you have the parent based routine. This is something you basically set according to your own rules. Nap times, bed time and bath time for example, are all done at the same time regardless of how your little one feels about it! Then secondly there’s the baby based routine. This is a routine that fits around your little one. So you follow their cues as to when they’re hungry, tired and so on. Many parents find the best results by working in a combination of the two. A combined schedule allows you to be a little more flexible than a parent led routine, but largely remains unaltered on a day-to-day basis. Whichever type of routine you do choose to follow, the key is to be consistent. There are times, such as during milestones like teething, where the routine will need to be adjusted slightly. There’s also going to be days where the routine just doesn’t go to plan at all. There is no foolproof way to create and stick to a routine 100%. However, as long as you largely follow the routine as much as you can every single day, it will really help. If you allow your baby to nap for an extra half hour one day, then an hour the next for example, they aren’t going to know what is expected. Overall creating a routine isn’t as easy as you think. A lot of factors need to be considered. It needs to be something you’re going to be able to follow every day. So create a routine that works for you as well as your little one. Do you have any additional tips or advice for parents trying to create a routine? Leave your comments below! Parent Led, Baby Led And Combination Routines – Which Is Best? You are right. Consistency is the name of the game. Also giving into the child’s routine can ruin a mother’s life. Some babies sleep during the day and stay awake the right through and this as you say is because no attempt has been made to get the baby out of that routine A healthy routine both for the baby and the mother is what one should aim at . That is correct, iamawriter. The routine should be beneficial for both baby and mommy. It would need some time to get used to a routine but when the baby finally gets used to it, it will be much better. However, a parent must remember that the routine could change in a few weeks or so as baby grows so a parent should also be flexible. Good points to note. I quite agree with you. Although, am not yet married, but i can relate with the points highlighted above. I’ve seen some parent who do similar to this. I believe when this is properly adopted, it will help parents set up a baby routine. Quite a good number of parents out there, find it challenging when it comes to setting up a routine for their baby. Work, stress could be a factor responsible for this. You are right is not easy as it seems, to create a routine for our baby, we need to work a lot and be consistent and always watch our baby behavior and try to find something that would fit its character and wishes. In this way, our baby would accept much easier a routine. You’re right, wallet. It’s not easy to create a routine but consistency is the key. And yes, parents need to take note of their baby’s behavior because it changes as the baby grows. So when it changes, adjustments should be made with the routine.